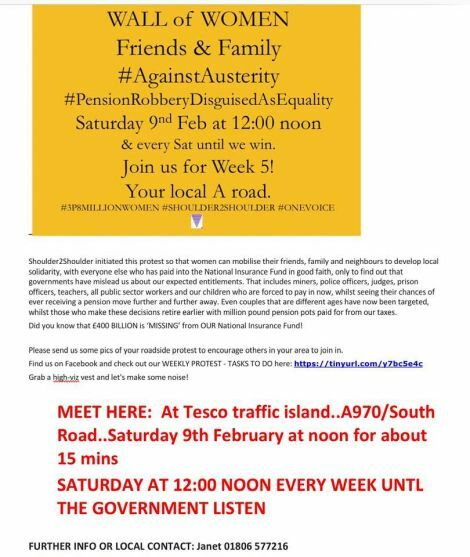 LOCAL campaigners are taking their protest against state pension ‘inequality’ to the streets of Lerwick on Saturday when a ‘Wall of Women’ will gather at the Tesco roundabout. The protest follows on from a meeting hosted by isles MP Alistair Carmichael in December when dozens of people voiced their anger at the recent changes in the retirement age for women. With this being increased from 60 to 66, many women born in the 1950s feel betrayed as many will now have to work for another five or six years before being entitled to the basic state pension. Saturday’s protest is initiated by Shoulder to Shoulder, a national organisation raising awareness and campaigning for women and men affected by the increase in the state pension age. Saturday’s event will be the most northerly #PensionRobberyDisguisedAsEquality protest so far. Local organiser Janet Ainsworth said she hope many local woman, friends and family would turn out and make a lot of noise on Saturday, “and every Saturday thereafter, until the government starts listening”. She said: “This is the fifth week that this is ongoing now across the UK, and now for the first time in Shetland. The protest starts at midday, and is planned to take 15 minutes. More information from Janet Ainsworth on 01806 577216.